Bathing is often the first personal care task that a person with dementia needs help with. Bathing is often the first personal care task that a person with memory loss needs help with. But helping a relative with memory loss to bathe can be touchy, difficult, and easily lead to aggressive, angry behavior. And why not, when someone needs help with a task he or she has done independently for decades? The loss of privacy and dignity is just one of many triggers that can make bathing very difficult. That’s why we shared our chapter, “Why won’t she take a bath? Helping your relative with memory loss with bathing”on our website. This blog offers some tips to get you started thinking about bathing. Much more can be found in the online chapter and in our book, Coping with Behavior Change in Dementia: A Family Caregiver’s Guide. She may have forgotten when she took her last bath. She may be in pain: joint pain, for example, can make it difficult to get to the bathroom, and in and out of the shower. She may be tired: not sleeping well, or asked to bathe when she is tired. She may be depressed: often people who are depressed do not see the need to take a bath or may not have the energy to take a shower. She may be afraid of falling, or getting in and out of the bath or shower. She may be asked to bathe at a time that is not familiar to her. Water might not feel good on her skin; having water come over her head and face may be frightening. She may not remember how to do all the steps in bathing: wet the washcloth, put soap on the washcloth, etc. “Why won’t she take a bath? Helping your relative with memory loss with bathing” offers strategies for each of these situations. Watch your tone of voice. In particular, avoid sounding bossy! Without meaning to, care partners often sound bossy, especially when they are tired or frustrated. This tends to breed resentment and resistance to being told what to do. Think about how you are going to approach this conversation ahead of time. How can you use a hook or reward? Can you mention an upcoming visit, a trip to church or synagogue, or a dish of ice cream afterwards? During the bath, explain things clearly. If your relative doesn’t understand what is going on, it may increase her fear or anxiety. You may need to give step-by-step instructions. If the answer is “no”, ask your relative why she doesn’t like to bathe. If she is upset, in pain, or fearful, she may be able to tell you the reason herself. Try to schedule bathing at the same time she is used to —but pay attention to fatigue levels. If she has always bathed at night but is now exhausted or more confused by early evening, you might try a different time of day. Drape a towel over your relative’s shoulders or lap. Some families have the person shower in her underwear or bathing suit to protect modesty. Try to make the bathroom as comfortable, warm and inviting as possible before the bath begins. Use non-slip washable bathmats inside and outside of the tub or shower. Use towels and other bathing supplies with colors that contrast with the bathing area. 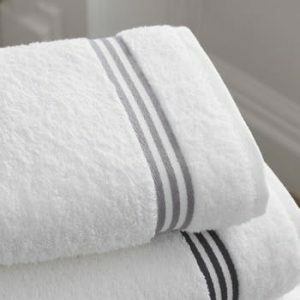 A white bathtub, white washcloth and white bar of soap may all blend in together, making it hard for your relative to locate the washcloth and soap. Joan McCay hated having anyone assist her with bathing and became quite angry whenever it was attempted. Her daughter Alice began to think about the whole bathing experience from “setting the stage” for a bath to sharing a pleasant experience with her mother after the bath was finished. She decided to try a new approach. First, Alice got the bathroom ready and turned on the heater. Then she and her mother looked at a favorite photo album together. Next Alice said, “Mom, the shower is ready. Let me help you off with your shirt and give you a hand into the shower so you don’t slip.” Joan started to get angry and Alice replied, “Mom, John is coming to visit later and I know you want to look nice. I’ll help you.” After she had her mom seated in the shower, Alice used the handheld sprayer to help her get the water the right temperature. Then she put a towel around her shoulders, gave her mother the washcloth and had her wash while Alice held the sprayer the way her mother wanted it. When Joan was dressed again, Alice had a snack waiting for her. Although there were some tense moments, the bathing process went smoothly. Alice practiced remaining calm and ignoring angry outbursts. If your relative particularly dislikes receiving help from a family member, consider hiring a home health aide to assist with bathing. If you do, you might want to have the aide help with other things as well, such as changing beds or laundry. You might not want to introduce bathing until your relative has established a relationship with the aide.